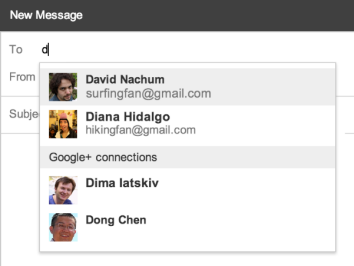 Gmail G+ integration: Google Plus users can now email you, unless you opt out. Google Is About to Let Total Strangers Email You. Here’s How to Opt Out. Google Plus users can now send emails to your Gmail even if they don’t know your address. Google just announced a big change that, as far as I can tell, no one was asking for except perhaps the people who run Google Plus, its failed Facebook clone ubiquitous online identity service. Have you ever started typing an email to someone only to realize halfway through the draft that you haven’t actually exchanged email addresses? If you are nodding your head ‘yes’ and already have a Google+ profile, then you’re in luck, because now it’s easier for people using Gmail and Google+ to connect over email. As an extension of some earlier improvements that keep Gmail contacts automatically up to date using Google+, Gmail will suggest your Google+ connections as recipients when you are composing a new email. But a Google spokesperson confirmed to me that the default setting will be “anyone on Google+,” so you’ll have to change it if you don’t want strangers cluttering your inbox. Some critics have quite understandably objected to Google’s making this an “opt-out” rather than “opt-in” feature. Google is careful to note that people who send you messages in this way don’t actually see your email address. In some ways that seems like splitting hairs—who needs your email address when they can send you emails without it? In other words—and to be clear, these are my words, not Google’s—they were afraid no one would use it. And that fear overrode the privacy concerns.